French cook Joel Robuchon poses on Dec. 6, 2014 in Bordeaux, France, in the kitchen of La Grande Maison. First he cracked the code. Then he rewrote it. French chefs who covet Michelin stars study the restaurants that get them, and the ones that do not, before deciding where to devote their money and attention. If there is a formula behind the rating system, which for many chefs is an article of faith, almost no one figured it out the first time. 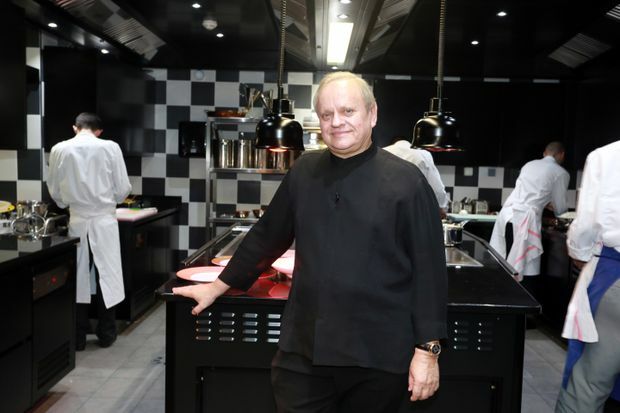 Joel Robuchon, who died Monday at 73, came closer than anyone. Robuchon’s first restaurant, Jamin, was given one Michelin star in its first year. It got another in its second, and the next year it climbed to the top step, a three-star ranking. Robuchon was still in his late 30s. What could he do for his next trick? There were new dishes to invent, new honors to win, new employees to terrify. The chef Eric Ripert, who was one of them, has said that he still has nightmares about covering plates with the precisely sized and spaced dots of sauce that were a Jamin signature. Playing the kitchen tyrant, regularly berating young cooks for mistakes nobody else would notice, Robuchon embodied the old order. At the time, this boot-camp style of running a kitchen was state of the art. But it had already come to seem counterproductive, disrespectful and unprofessional long before his death. In retrospect, the internal forces that he gave vent to when he screamed at his cooks must have also tormented Robuchon. For most of his career he was restless, unsatisfied. At 51, he tried to retire; of course, it did not last. In 2003 he returned, and this time he seemed determined not to give the Michelin inspectors what they wanted. L’Atelier de Joel Robuchon, his comeback, was staged in a former sushi bar in Paris. He retained the basic setup. Diners sat at a counter, and rather than nigiri and maki, they ate his spoonable pommes purées and langoustines fried inside a single leaf of paper-thin pastry. If you think the Figaro was overreacting, it is because the revolution succeeded. Today, expensive dining is more likely to mean stools and a counter than dining tables on a sea of carpeting. The trappings that Robuchon stripped away – the linens, the large dining rooms, the kitchens kept out of sight – were not just costly to maintain but, by that point, increasingly off-putting, especially to younger diners. Today we do not expect – or even want – carpeted, hushed spaces when we go out for meticulously prepared food. Robuchon was not the only chef of that era hoping to add to the restaurant experience by means of subtraction. In the same year, Paul Kahan and Donnie Madia opened Avec in Chicago, a long skinny restaurant dominated by its counter. Sitting on a bar stool was synonymous with eating at the chef David Chang’s Momofuku restaurants in the first few years of his career, from Noodle Bar in 2004, to Ssam bar in 2006, to Ko in 2008. The project of burying the old-fashioned signifiers of luxury and replacing them with new ones has been, in fact, one of the major themes pursued by chefs over the past 15 years. But nobody made a splash doing it like Robuchon. And in the second stage of his career, he planted Ateliers around Asia, Europe and North America, accumulating 31 Michelin stars. No other chef has as many. This time, he had set the formula.